DigitalOcean’s Block Storage allows you to create and attach additional storage volumes to your DigitalOcean Droplets. Volumes are an independent resource that can easily be moved from one Droplet to another within the same datacenter. Attached volumes function like locally connected storage drives, allowing you to manage your storage with familiar tools and techniques. What is DigitalOcean Block Storage? What are some ways to use Block Storage? DigitalOcean Block Storage is a flexible, convenient way of managing additional storage for your DigitalOcean Droplets. Block Storage is provisioned in units known as volumes. Volumes function as block devices, meaning they appear to the operating system as locally attached storage drives which can be partitioned and formatted according to your needs. Volumes are charged at a rate of $0.10 per GB per month. For example, if you create a 100GB volume, you would be charged an additional $10 per month. A volume will be charged from the moment it is created until the time of deletion in hourly increments, just like Droplets. Storage media: Like Droplets, storage volumes are backed by SSDs. Available sizes: Storage volumes can be created in sizes ranging from 1GB to 16TB. Region Support: Currently, volumes are available in NYC1, SFO2, FRA1, and SGP1. Volumes are region-specific resources. Volumes can be moved freely between Droplets within that region. A volume may only be attached to one Droplet at a time. However, up to five volumes can be attached to a single Droplet. When Should I Use Block Storage? Block Storage is a good solution in scenarios where you need more storage space, but do not require the additional processing power or memory that a larger Droplet would provide. Block Storage volumes can be created, destroyed, or expanded easily as your needs change, simplifying initial planning around your storage requirements. Since Block Storage is not a highly specialized resource, it can be used for just about anything that would benefit from additional disk space. 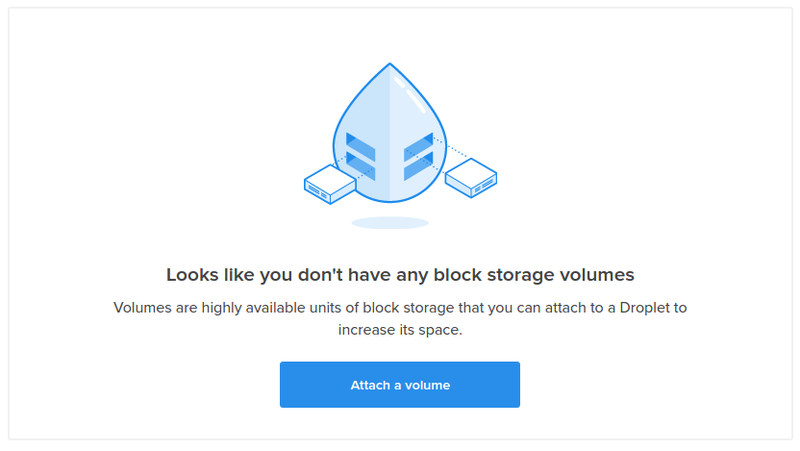 With these points in mind, let’s take a look at how to use DigitalOcean Block Storage. The main interface for creating and attaching DigitalOcean volumes is through the Volumes section of a Droplet’s detail page in the DigitalOcean control panel. This menu section will be available for Droplets in regions with volume support (currently only NYC1, SFO2, FRA1, and SGP1). You will be given the option to create a new volume or attach an existing volume. The default selection will create a new volume. After you have made your selections, click on the Create button at the bottom. Your new volume will be created and attached to your Droplet. You can now move on to partitioning and formatting the new volume from within your Droplet, which is covered below. Select the volume you wish to attach to the Droplet. When you are finished, click on the Attach button at the bottom. The volume you selected will be attached to your Droplet and will be immediately visible to the Droplet’s operating system. To get started, you just need to configure the new storage space. If you already have a filesystem written to the volume, you can mount the filesystem and begin using it. If you have not yet formatted the space, follow the steps below. To begin, log into your Droplet with a user with sudo privileges or as root. Newly created volumes require some preparation before the server can begin to utilize the additional space. Volumes must be partitioned, formatted with a filesystem, and mounted. Most of the time, the /etc/fstab file should be modified as well, so that mounting will take place automatically at boot. While this process can be modified significantly according to your needs and may vary slightly depending on the Linux distribution, the procedure below can be used to get up and running quickly in most cases. Our article on partitioning and formatting DigitalOcean volumes provides more in-depth instructions if needed. When you are finished, skip the next section to test to make sure the volume is working correctly. Continue below to test that the filesystem is mounted correctly. To remove a volume from a Droplet, you can either delete or detach the volume. Deleting a volume: permanently destroys the volume and its contents. This action cannot be reversed. Detaching a volume: simply removes the volume from its current Droplet. The volume and all of its contents can later be attached to a different Droplet as needed. To avoid operating system errors within your Droplet, it is important to ensure that the volume isn’t in use before performing either of these actions. The first step in detaching or deleting a volume is to ensure that the volume is not being actively used within the server. The best way to do this log into your server and unmount the associated filesystems. If the command displays any output, you will have to stop the listed processes before unmounting the filesystem. From here, you can safely detach or delete the volume from the DigitalOcean control panel. To completely destroy a volume and all of its contents, visit the Volumes section of the Droplet’s detail page. Deleting a volume is irreversible. Please be sure that you select the correct volume in the steps that follow. The volume and its contents will be completely deleted. This action is irreversible. You can now attach the volume to a different Droplet as needed. It is possible to increase the size of an existing volume to give yourself access to additional capacity. This procedure involves resizing the volume itself within the control panel and then adjusting the partitions and filesystems on the volume to utilize the additional space. Read our guide on Increasing the Size of a Block Storage Volume to learn how to resize an existing volume. While the Volumes menu within a Droplet is the primary management interface for volumes, there are other places where volumes can be viewed and managed. This interface can be used to attach, detach, or delete any of your volumes. This interface is primarily used to provide account-wide management of volume resources. Using the volumes feature during creation will filter the available Droplet regions and will automatically assign the volume name. The DigitalOcean API can also be used for Block Storage management tasks. While using the API is out of scope for this guide, you can learn more about how to control your storage resources programmatically by viewing our API documentation. An alternative to using DigitalOcean’s API directly is to use doctl, the DigitalOcean command line client. Block Storage volumes can be created, deleted, and managed with doctl in much the same way as other DigitalOcean resources. You can find out more by reading our guide on using doctl to manage DigitalOcean resources. You should now have a basic understanding of how DigitalOcean Block Storage works and how to create and manage volumes within your account. By leveraging Block Storage, you can now manage storage requirements with greater flexibility. 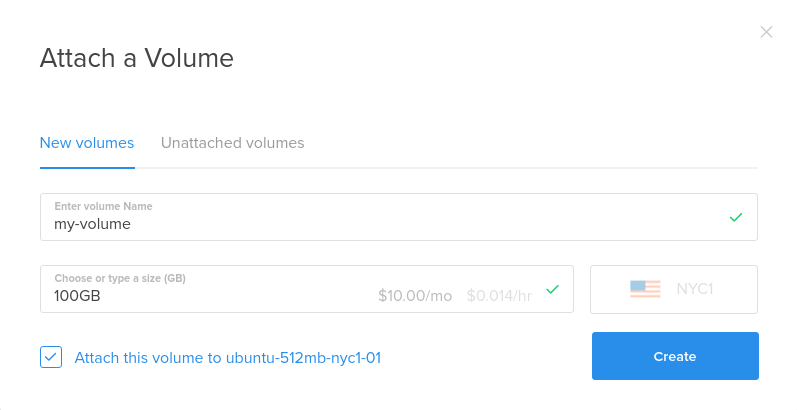 DigitalOcean Block Storage allows you to attach additional storage volumes to your Droplets quickly and easily. Block Storage volumes function like regular block devices when attached to your servers, allowing you to use familiar tools to manage your storage needs. In this series, we will introduce basic Linux storage terminology, cover how to create and manage Block Storage volumes, and how to perform a variety of administrative tasks to keep your volumes running smoothly. Linux has robust systems and tooling to manage hardware devices, including storage drives. In this article we’ll cover, at a high level, how Linux represents these devices and how raw storage is made into usable space on the server. 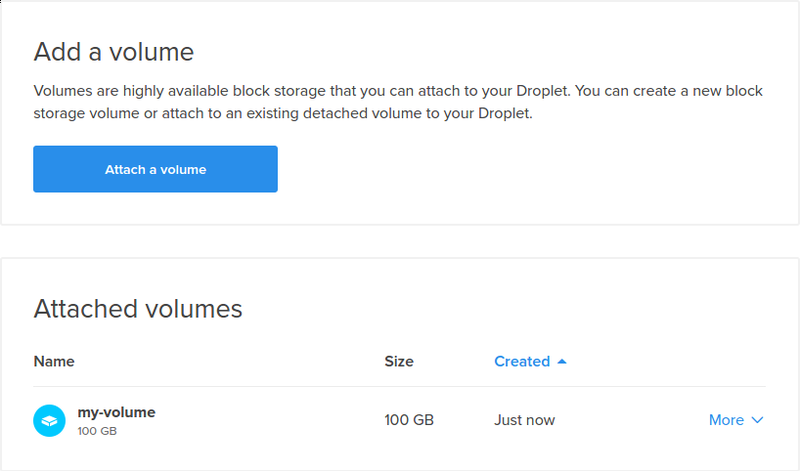 DigitalOcean Block Storage volumes provide an easy method of adjusting the storage space available to a Droplet. After creating and attaching a volume to a Droplet using the DigitalOcean control panel or API, the raw storage space must be partitioned, formatted, and mounted before it can be used. This guide will cover how to complete these steps when working with volumes. By attaching a DigitalOcean Block Storage volume to a Droplet, you can easily increase your server’s capacity as your requirements change. While it’s possible to attach multiple volumes to a single Droplet to expand the available capacity of your server, it’s also possible to expand the size of an existing volume. This process involves increasing the size of the volume in your DigitalOcean account, followed by some operations on the server itself to expand any partitions and filesystems. Continuous use of SSDs results in degraded performance if not accounted for and mitigated. The TRIM command is an operation that allows the operating system to propagate information down to the SSD about which blocks of data are no longer in use. This allows the SSD’s internal systems to better manage wear leveling and prepare the device for future writes. Continuous TRIM is possible, but can negatively impact performance. Scheduled, periodic TRIM is a good alternative in most cases. Is it possible to resize the volume? Suppose I create 500GB volume, what will be the procedure to increase/decrease the size? @ssrahman It is possible to expand a volume, but not decrease it’s size (due to the potential issue of data loss). The More menu of a volume gives you the ability to expand the volume. Once you have expanded the volume in the control panel, you’ll also have to make sure to resize the filesystem written to it to use the extra space. I’ll be updating the article with instructions or a link to the procedure soon. You need to find the volume (not the partition) and the /dev/sd* identifier that it is currently associated with. The growpart tool can only handle /dev/sd* identifiers. Hopefully that helps. We’ll be getting some more complete content up on this soon. @ssrahman Forgot to mention this in the last comment. The growpart command is really simple, but most currently shipped versions have a bug that prevent resizes above 2TB in size. For these situations, you will have to remove the current partition and write a new partition with the same start location, but expanded to the end of the disk. the space (an extra 16567500800 blocks) or continue with the current setting? That should work for larger resizes.